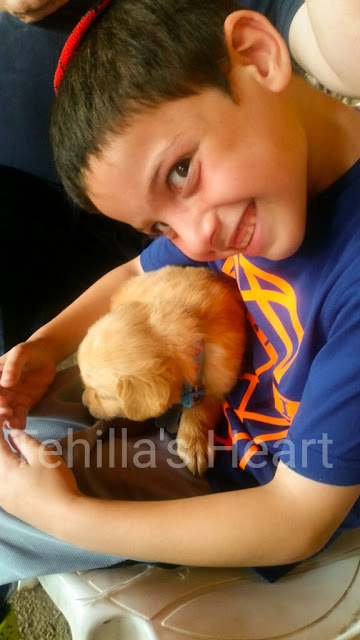 Tehilla's Heart Journey: Sammy Balofsky! We are welcoming to the family our 7 week old golden retriever puppy, Sammy! Sammy will be Tzviel's dog but an important part of our family. With all that our family has been through, it has taken a big toll on everyone in our family. Some TLC from a very sweet, affectionate dog will provide some stability and animal therapy for years and years. We have been working on this for over 6 months and have everything ready. Tzviel and I have been watching dog training videos. He has been practicing on Hunter, Mechal's cat, with no luck. Speaking of which, yes- Hunter is staying, no- we aren't worried. We consulted our vet and Hunter is comfortable around dogs in our home. We are very excited for this new transition. For the next bunch of weeks, we will be limiting the guests into our home, until some basic training has caught on. Wish us luck and send Sammy some blog family love!